If you've lived in Phoenix for a long time (and I've lived there longer than I care to admit), it's fascinating to see it from the viewpoint of someone else. I do this as much as I can, and I call it "looking through someone else's eyes". And it can be quite amazing, and paint a picture of what you hardly see at all as unique, and maybe even a little bit bizarre. 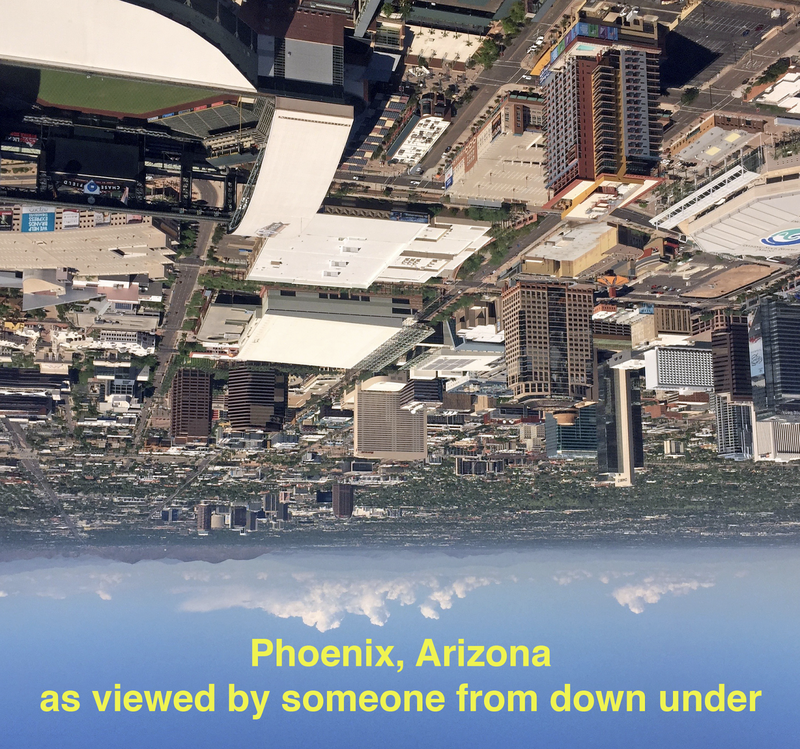 Today I talked to a friend of mine who has lived in Phoenix for many years, but his heart is definitely still down under (Australia). And so I've been thinking about what Phoenix looks like to him. First of all, it's in the United States. I know that sounds strange, but it's something that I rarely think about. My Australian friend sees this as the U.S., not just Phoenix, and not just Arizona. And we do a lot of strange things here, like drive on the wrong (right) side of the road. I often wonder how he manages to switch back and forth (he visits back home every year) but he just shrugs it off. To me, it's a super-power. Like most people in the U.S. I can't even imagine trying to drive on the left side of the road. And while he's too polite to ever say this, he probably thinks of us as, uh, well, kinda stupid because we can't do that. He also has no problem with roundabouts, which to me is like suddenly putting up calculous equations in the middle of an intersection - I still really don't understand any of it. I just hope that he's patient with me as I try to figure out which lane I should be in, who has the right-of-way, etc., and he can do it from both sides of the road. And, as you'd expect, his number one comment about Phoenix is, "It's too bloody hot". If you Google Norfolk Island, where he lived for many years, you can see what he considers average weather. To me, it seems like San Diego, only nicer. And I really don't need to be reminded how ridiculously hot it is in Phoenix, but this really drives it home. What in the world are people doing living in this oven? And it's gets weirder. Because as I write this, in November, approaching winter here in Phoenix, it's becoming summer in Australia. Of course, where my friend lived the weather was just about perfect all year 'round, so he still grumbles a bit about having to wear even a light jacket (it was in the sixties this morning). Or I suppose the teens to him. Like most Americans, I never learned metric, but he switches easily between kilometers and miles and Celsius and Fahrenheit. What idiots we must seem to him! And don't get him started on explaining how Cricket works! But of course he's here in Phoenix, and has been for years. As long as I've known him, he's talked about moving back to "Oz", but there must be a reason that he stays in Arizona. I can't tell why yet, but hopefully I'll learn. I like it here, and may be he does, too.